Add Some Greenery to Your Life!This book will show you how to use overlooked pots to their full potential and transform your garden--whether you've only got a modest balcony, a small square of patio or just a windowsill. Container Gardener's Handbook covers a range of different planting schemes and types of container, from urns and troughs to chimney stacks and hanging baskets. You'll find expert advice here on what to grow, from bonsais, bulbs and bamboos to tumbling and creeping plants and flowers--and learn how to make a living wall, a pond in a metal trough, or even your own homemade containers. 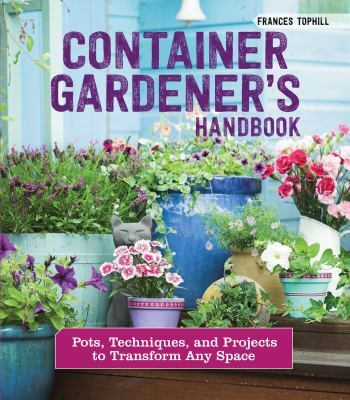 Inside Container Gardener's Handbook· 41 inspired projects for creative and sustainable container gardens.· How to use containers to bring nature to the most inhospitable and smallest of spaces.· Choosing the right size, shape and materials for your containers.· How to pair plants and pots, upcycle existing items, and create your own containers.· Advice on drainage, compost, additives, fertilizers, mulch, feeding, watering, deadheading, and more.· Creative ideas and step-by-step instructions with bright and informative photography.